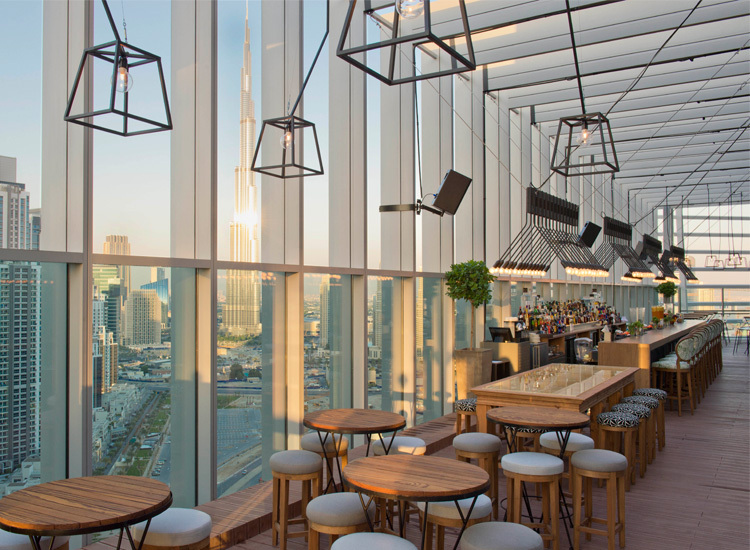 Originally from Beirut, the popular Lebanese bar and restaurant opened its first venture in Dubai in 2013, which was quickly followed by a second restaurant in Abu Dhabi. The Dubai branch describes itself as “modern but unconventional”, serving “simple and elegant” dishes. The sharing style menu is a mixture of international high-end bar food. There are plenty of sliders (from ‘mini truffle burgers’ to ‘fresh creamy burrata’), sushi, carpaccio and tartar. Standout dishes are the ‘glazed black Angus beef’ and the ‘Peruvian spicy tuna’. The waiting team is on the ball and very attentive. When we visited, they were incredibly intuitive, and allowed us to stagger the sharing dishes across the evening. Iris is situated on the rooftop of The Oberoi in Business Bay, giving it panoramic views of the surrounding neighbourhood. Located close to DIFC, there are plenty of well-heeled diners visiting straight from work, sharing food and after work drinks. Early in the evening there’s laidback lounge music, which is later replaced with a live band.